This Sunday will mark 100 days since Cyclone Pam struck Vanuatu on March 13, with wind gusts of up to 320 km an hour leaving behind widespread damage. In keeping with Indigenous practice, ceremonies will be held in villages across Vanuatu to mourn the 11 people who died in the cyclone. Gathering in churches and around gravestones over the weekend, people will reflect on their lost loved ones, damaged houses, ruined food gardens. One hundred days later, Vanuatu is recovering. Islands left brown in the aftermath are green again. Immediately after the cyclone people began to rebuild. They treated the injured, repaired their houses and, where seeds were available, replanted gardens. Villagers didn’t wait for donors or the government: they simply, pragmatically, began to rebuild. Perhaps not with the best materials, or in the safest ways, but people nevertheless began rebuilding. These efforts have made “resilience” the catch-cry of government and humanitarian organisations alike. But some questions remain about the Vanuatu government’s resilience-based approach. One hundred days later, Vanuatu has moved from a country in crisis to a country rebuilding. This is in large part due to the capacity of local people and to the success of the post-cyclone aid intervention. The efforts of the Vanuatu government’s National Disaster Management Office in coordinating the aid effort should also be praised, given the herculean nature of the logistical task of distributing aid to around 100,000 people across islands without airstrips, roads or functional telecommunications in the initial weeks. Watch the path of Cyclone Pam in mid-March 2015. Relying on local resilience and banking on local food stocks, the Vanuatu government delayed the initial aid distribution by a week to 10 days to avoid creating a culture of donor dependency. But this approach assumes that remaining food stocks will reach those most vulnerable. The government’s decision to hold back aid went unchallenged by international humanitarian organisations engaged in the relief effort. While large-scale humanitarian organisations were initially held back from delivering aid, locally-based “renegade aid” organisations stepped into the breach. This renegade aid movement was organised around the local privately funded ambulance services and included outreach provided by expatriate residents to communities on the main island of Efate. With few professional staff and small amounts of funding, these initial aid distributions appeared haphazard in nature, creating local confusion about distribution of food and water supplies. A cyclone-damaged home with a tarpaulin covering its roof. Rhetoric around local resilience informs governments’ understanding of vulnerable populations during disaster recovery. Governments in Melanesia often insist there is no poverty because everyone has access to land, which provides people with a social safety net. Cultivation or food collection on customary land is indeed the basis of subsistence for the overwhelming population of the Pacific. But an increasing number of people have limited access to land. On Efate Island, 56% of the coastline is leased, in many cases for tourist resorts and housing for foreigners. 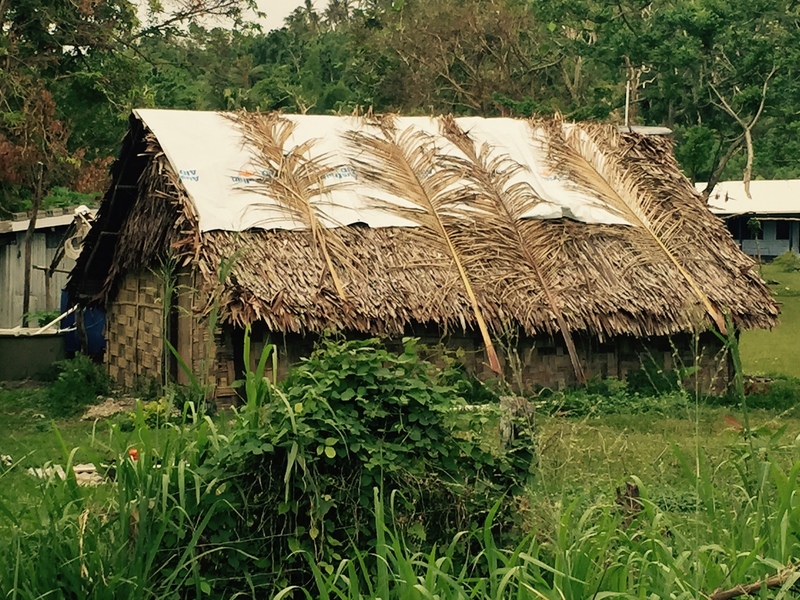 This large-scale leasing meant that food security was an issue for rural Efate communities after Cyclone Pam. People in urban locales are usually the ones with least access to land. Across the Pacific, rapid urbanisation means that there are increasing numbers of people living in informal settlements who are particularly vulnerable to disasters. These people are already living a marginal existence, so when disaster hits they become acutely vulnerable. Their settlements are often located in disaster-prone areas, on the edge of rivers which flood. Just two weeks after the cyclone hit, the Vanuatu government’s decision to evict thousands of people remaining in the 48 evacuation centres located across Vanuatu was based on the idea of resilience through family connections. Cultural understandings that everyone has family who can care for them need close consideration in the context of increasingly urbanised Pacific populations. Specific strategies need to be developed to deal with vulnerable urban groups in times of natural disaster. vacant state land can be used by community groups for food gardens and any people who do not have access to land in town can apply to the Department of Agriculture and we will allocate them land. Improving access to garden land will help in the immediate recovery, but sustained planning and funding is needed to prepare seedlings and technical assistance ahead of future disasters. the future doesn’t look good for locations that are prone to natural disasters. Resilience rhetoric can mask vulnerabilities. Let’s learn from Cyclone Pam so that future help can be as effective as possible. Siobhan McDonnell is PhD Candidate, School of Culture, History & Language at Australian National University.